In the wake of Sarbjit Singh's story and its relevance, all shortcomings of the movie become redundant. But end of the day, this is a commercial film and you can't discount the quality of cinema. On that count, Sarbjit is a definite letdown. Considering the subject matter, this movie should've been a lot better than it turns out. Sarbjit is a brave attempt, but the treatment is so melodramatic and so shrill, you come away with a heavy aching head, instead of a heavy heart at the tragedy of the peoples from both sides of the border. 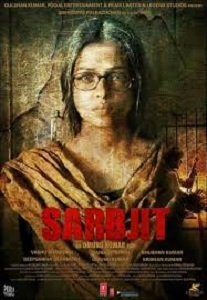 A strong story that is made better by Randeep and Richa only to be pulled down by Aishwarya. The film is evenly paced with a few lengthy and unwarranted scenes but overall, Sarbjit Aitwal's story is worth a watch, as it touches the right emotional chord. Randeep Hooda makes SARBJIT watchable! The loud and insistent melodrama takes away from the pathos of the central character’s story. Dalbir Kaur has separated from her husband (Ankur Bhatiya) as he used to physically and mentally torture her. The movie cleverly avoids India-Pakistan politics to keep controversies at bay and ends up being a commercial drama, an entertaining and emotional one. The film is evenly paced with a few lengthy and unwarranted scenes but overall, Sarbjit Aitwal’s story is worth a watch, as it touches the right emotional chord. Sarbjit fails to rise above its commercial nature to actually hit you in the gut with its real story. Aishwarya Rai Bachchan & Randeep Hooda Deliver The Performances Of A Lifetime! This film could've been the surprise winner of the year, given the effort pulled in by Hooda and Chadha. But the camera's obsession with Mrs Bachchan ensures that their compelling performances are restricted to the background. Purple lipped or not, this one is a miss. Randeep Hooda stands out in this melodramatic melange of cardboard cut-outs that substitute for characters. Randeep and Aishwarya’s EARNEST performances can’t save the film from SINKING into a whirlpool of melodrama! Sarbjit Atwal's story is worth a watch, as it touches the right emotional chord. Despite an overdose of melodrama, Aishwarya Rai Bachchan and Randeep Hooda make the first half a compelling watch!